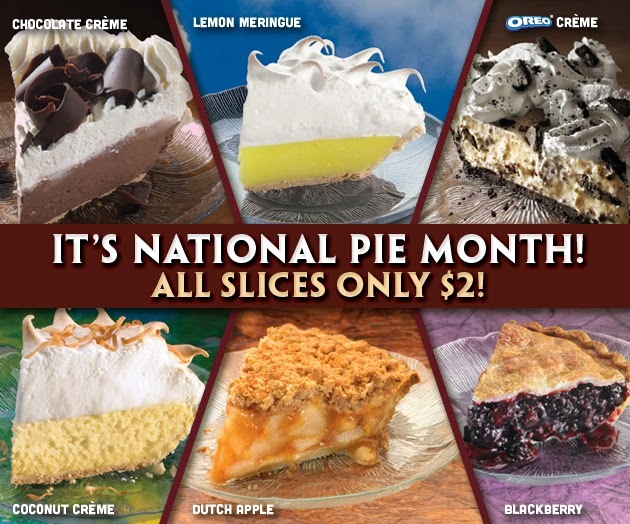 It’s National Pie Month and we’re celebrating all month long by offering $2 slices of pie! All day, every day! Choose from Dutch Apple, Oreo Crème, Lemon Meringue, and many more. What can we say? We think pie is perfectly acceptable for breakfast, lunch, and dinner! Just remember that our pie selections vary by location so be sure to ask your server about today’s selections. Thanks for your comment! We’ll be sure to pass it along to our menu development team! Yeah, our waitress just told us that eat n park will not be selling cherry pie ever again because it is too expensive. She went on to inform us that they had not been selling cherry pie for at least two years. It has been a while but you never know when we may decide to bring an old favorite back! Hello! We do offer limited time code words for our app, but the majority of our coupons are loaded in your message center automatically. Let us know if you aren’t seeing them – you should have received one yesterday! Your cherry pie was the best - I'm hoping you will bring it back too. Thanks for your comment! We'll be sure to pass along your suggestion to our menu development team! BOGO Pie Coupon - Saturday, February 28th ONLY! Free Valentine Smiley Cookie & More!